Dec. 26 — Power to the people! 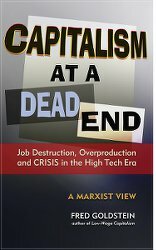 Since this has been the holiday season of consumer shopping frenzies and enlarged corporate profiteering, I thought it would only be fitting to offer a present of my own to the millions of workers out there who rarely get a glance inside the U.S. 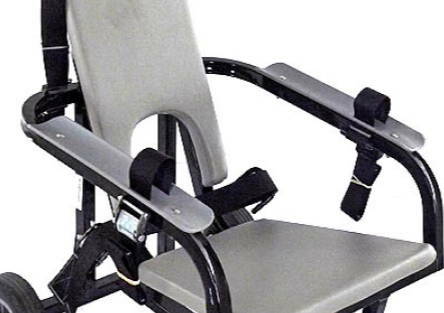 Torture Centers to see firsthand the U.S. torture devices right off the assembly line. So here is an exclusive exposé to the masses who read Workers World newspaper. 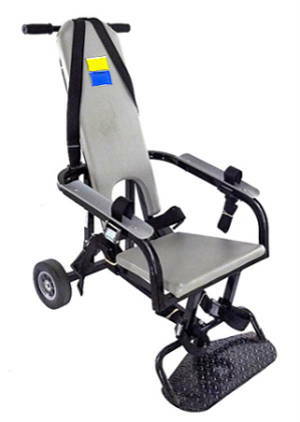 Here is the clever publicity photo from just one of numerous U.S. companies pushing a sanitized, sterilized version of the so-called “Compliance Chair.” This product’s original purpose was for immobilization and “secure” transportation of a human being to a vehicle or a close destination within Bureaus of Corrections and other judicial centers. The machine may not appear too threatening. At a quick glance, or to the inexperienced public, it would be easy not to see the enormous pain inflicted by this horrid device. But it is this monstrous machine that prison plantations nationwide have adapted into a torture device where human beings are strapped in for hours of severe pain. 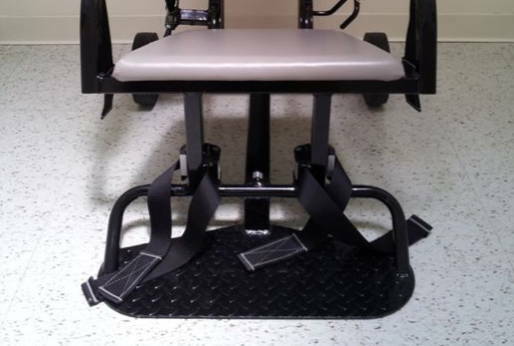 Straight from the Pennsylvania Department of Corrections, here is a picture of this torturous mechanical device as it is used, absent the inviting display by companies marketing the “Compliance Chair.” This torture chair is used throughout every prison plantation in Pennsylvania, on men, women and children. What you are seeing at the top of the photo are called the “shoulder straps,” which bend the shoulders backwards on a decline. In the middle of this barbaric chair are the “waist restraint straps,” which pull the pelvis and abdomen in such a manner as to cause an arch in the spine between the shoulder blades and the lower back spinal cord. The waist restraint straps guarantee that the victim of this torture is unable to move, often for periods of eight to 14 hours or more. Here you see on the sides two planks of plastic with straps. These are called the “wrist restraint straps,” and they cut off the blood circulation to both hands. The arms are laid into these restraints, a hard surface with no cushion or anything of that nature. There is nothing cozy or comfortable about this instrument of pain! The oppressors apply these straps in a deliberate manner so that they are so tight against the flesh that the poor soul’s hands can swell three times their normal size. Discoloration occurs in phases, from blue to green, then purple to black, while the fingers sting and then eventually go numb from lack of blood circulation. 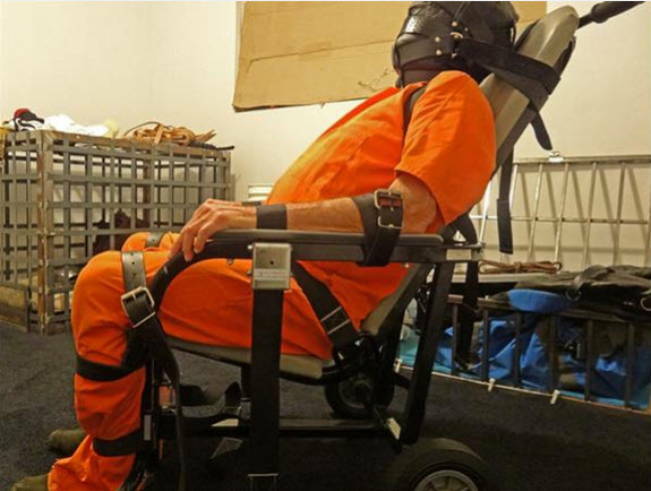 The final photo shows, at the bottom of the chair, the “ankle restraint straps,” which, like the wrist restraints, stop the bloodflow to the lower extremities. When the agents of repression assemble these plastic-coated straps around the ankles, there is no space left between the ankle straps and the skin, thus no blood circulation to the feet. The human being tortured in this fashion will feel their feet swell, turning blue, green and purple, causing incredible pain. For the victim of this torture device, there can be no movement from head to toe. The pain is so unbearable that, over the course of 8- to 14-hour confinement in the chair, the victim will travel outside their body in shock and will hallucinate. We want readers to know that, in addition, prisoners are naked, and that it is not unusual for there to be cold air blowing, for the victim to be sprayed with pepper spray and for the victim to have to sit in their own urine and feces until released. In this holiday season, besides Christmas, New Year’s, Hannukah and Kwanzaa, there is “Watch Night.” I’ve been told that this is the night that slaves knew at midnight they would be free because of the Emancipation Proclamation — or so they thought. With instruments of torture, the whip has simply evolved. So I ask readers and workers, are we really free? What’s the difference between whips and straps? Sehu Kessa Saa Tabansi is currently incarcerated in the Pennsylvania prison system. He is a founding member of the New Black August Collective and is serving a life sentence after having been wrongfully convicted.